As we prepare for the All-Star Game, the Atlanta Hawks are currently 5th in the Eastern Conference with a 32-24 record, which is almost identical to the Hawks record last season at this time, (31-24). The Hawks went through many ups and downs during the First Half of the season; unfortunately, the one trend that’s been consistent is their inconsistency. Watching this current Hawks roster for their first 56 games was a roller coaster and despite their record, they haven’t found their identity until their successful stretch recently. Despite their inconsistent performances and their flaws, one thing is certain, these Atlanta Hawks have continued to fight and still compete which is a major reason why they are the 5th best team in the Eastern Conference, only trailing the Toronto Raptors by 1/2 game for the fourth seed. Also, one of the fans favorites and Hawks shooting guard Kyle Korver was traded to the Cleveland Cavaliers after five years in Atlanta, which made the rebuilding rumors look like it was possibly beginning this season. However, during the height of the trade rumors, the Hawks began to grow together as a team and started building the chemistry that Hawks teams have built over the last decade and as NBA Trade Deadline looms, it appears the Hawks will only make a minimal move to help improve the roster for a playoff push. Although the Hawks have struggled throughout the 2016-17 season with their inconsistency, after the much-needed break, the second half of the season looks promising and appears that the players are finally settling into their role. Dennis Schroder has proven to be a promising starting point guard for the Hawks this season averaging 17.5 Points Per Game & 6.3 Assists Per Game as a starter. Schroder has his moments of inconsistent play; however, as the season went on, he matured every game as a starting point guard . Kent Bazemore is finally returning to the form and producing like the player the Hawks invested in during the off-season as he’s posting 11 Points Per Game. As his shooting percentage increases and shot selection improves, he’ll need to continue his progress and limit the turnovers and bad decision making that caused him to struggle. With Thabo Sefolosha’s recent groin injury, Tim Hardaway Jr has stepped in the starting lineup and continuing the trend of players thriving in Coach Bud’s system in their second year of action. Hardaway has not only been the surprise of the season, he’s also one of the team’s best shooters and productive players offensively as he’s averaging 13 Points Per Game. 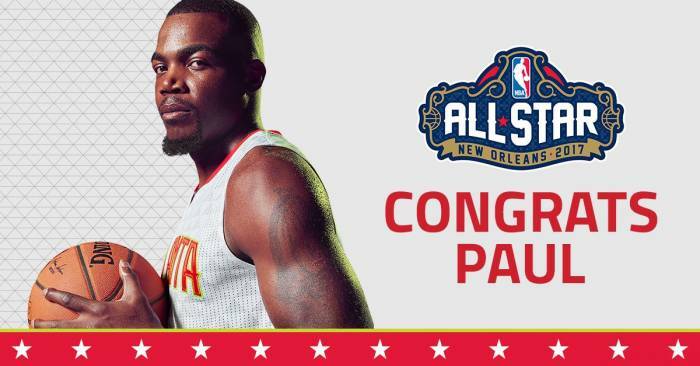 Paul Millsap, who earned another NBA All-Star Game appearance for the fourth consecutive season is without question, the anchor of the Hawks, averages 18 Points Per Game, 8 Rebounds Per Game, and 4 Assists Per Game. The new guy in town, Dwight Howard has not only provided the Hawks with their solution as a rebounding big man but has posted one of his best seasons in his career averaging 13 Rebounds Per Game while adding 13 Points Per Game. The Hawks second unit has improved as the regular season continues. The rookies are becoming to be a big part of the rotation as draft picks DeAndre Bembry and Taurean Prince are have the potential to be very successful as members of the Hawks, we’ve seen their growth throughout the season. After the Korver trade saga and a potential buyout that never happened, Mike Dunleavy reported to the Hawks and have provided a positive impact for the second unit. An area that the Hawks will need to see improvement and better production from resides with the big men. Guys like Kris Humphries and Mike Muscala will need to give Howard a reliable option when he’s not in the game. In conclusion, the Hawks are currently averaging 104 Points Per Game, 20th in the NBA, is below average in which needs some improvement, this is 20th in the league. On the defensive end, the Hawks are limiting their opponents to 104 Points as well, which ranks 5th in the NBA . Despite their struggles, the Hawks own one of the best defensive units in basketball and if the team could contribute consistently on offense, we could see Atlanta position themselves for a good playoff run. One way for the Hawks to improve is in their effort. We’ve seen Atlanta lose to a few below average teams such as being swept by the Los Angeles Lakers, Minnesota Timberwolves, suffering a blowout loss to the Miami Heat, it’s any given night in the NBA, however, they are losing matchups that should favor the Hawks and we’ve watched them lose in a flew blowouts; however, we’ve seen the Hawks compete and earn a few wins against some of the elite teams in the NBA, including an early season win against defending NBA Champs, the Cleveland Cavaliers, an overtime win against the San Antonio Spurs, sweeping the Houston Rockets and falling short in competitive games against the Golden State Warriors and Boston Celtics. As the second half begins on Friday against Miami, Hawks fans should be excited to see the team improve their team chemistry, consistency in their final 26 games, and last but not least closing out games in winning fashion. Here’s to an entertaining rest of the season for True Believers! Why the Hawks should consider making a run!